3' x 3' Kit - Contains 9 tiles and 12 edge pieces. 4' x 4' Kit - Contains 16 tiles and 16 edge pieces. 5' x 5' Kit - Contains 25 tiles and 20 edge pieces. 6' x 6' Kit - Contains 36 tiles and 24 edge pieces. 7' x 7' Kit - Contains 49 tiles and 28 edge pieces. 8' x 8' Kit - Contains 64 tiles and 32 edge pieces. 9' x 9' Kit - Contains 81 tiles and 36 edge pieces. 10' x 10' Kit - Contains 100 tiles and 40 edge pieces. Recommended Uses - Our Dance Floor Kits are the perfect portable dance floor great for both home and business use. 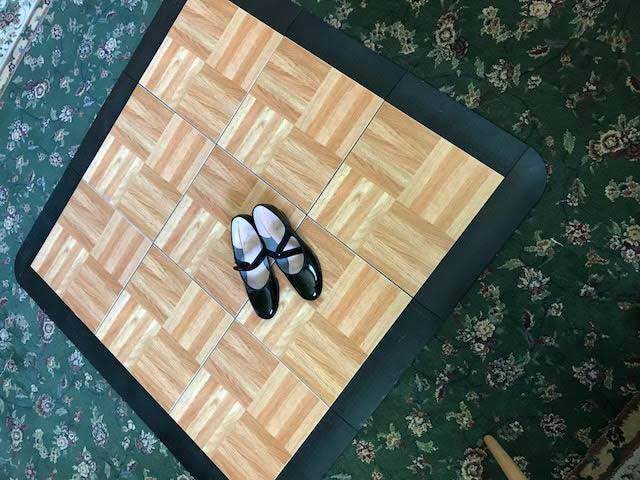 These dance floor kits are easy to install and disassemble and are commonly used as tap dance floors, event flooring, as a home dance floor, as an outdoor dance floor, as a studio floor and much more. Once the tiles are in place, you can then snap in the edge pieces if you purchased them. Note: Since our Modular Grid-Loc tiles feature a vinyl top adhered to the tile with a pressure sensitive adhesive, pressure may be needed to ensure that the vinyl top fully adheres. 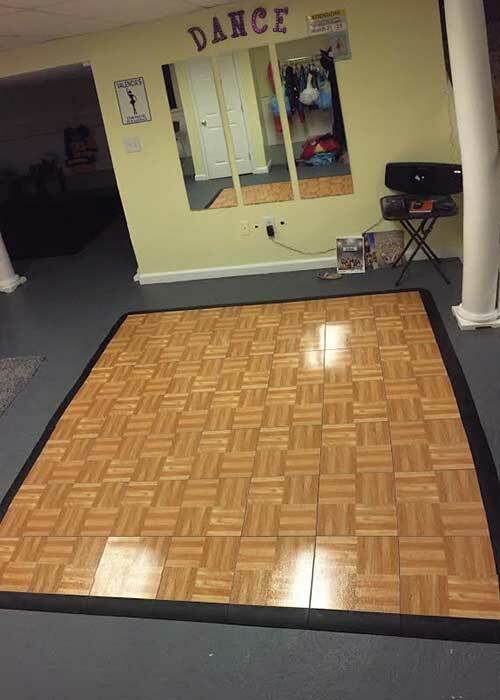 You can easily accomplish this by walking across the floor or by using a flooring roller for larger areas. 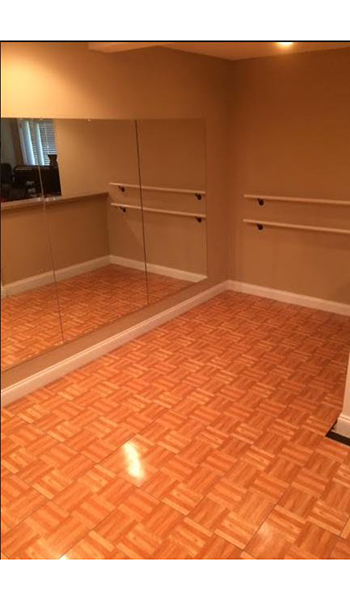 Great for Zumba, tap, aerobics and yoga. What is this modular floor made of? The tiles are manufactured with a high-grade polypropylene and have a vinyl top surface that replicates the look of wood. Dance floor kits can generally speaking be installed and used just fine over a dense, low pile type carpet. Over a high pile carpet, We would recommend putting down some plywood board to make sure you have a sturdy foundation underneath the tiles and that they do not come undone. We are wondering what thickness of plywood is recommended to use this floor over a carpet. Is there a thickness that works best? If the carpet is a high, plush pile a thicker would likely be better as it would lay more flat. How do the kits come, do they come in something that I can use for storage & transport, is the white easy to keep white? Dance Floor Kits are shipped in cardboard boxes. 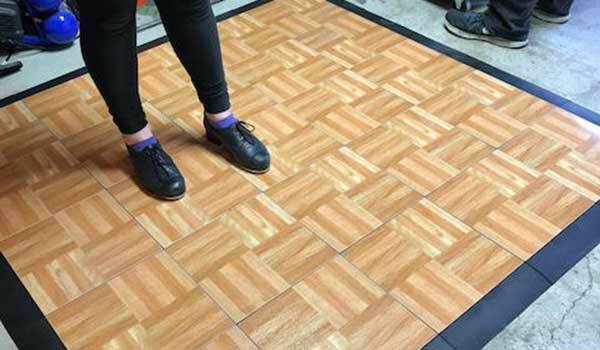 These tiles can be cleaned with a soap and water solution. I want to use this floor over low pile carpet for a rolling cabinet. Will the floor tiles remain flush as wheels are rolled across it? Will the surface deform under pressure? Each wheel would be supporting about 100 lbs of cabinet, but a ballerina on pointe would weigh more than that in the same area, so I was thinking this might work. More worried about whether rolling across two tiles would be a problem, as well as, the long term effects of cabinet wheels sitting in one spot for a long period of time. This use should be fine. The flooring product is great! Hi I am a 73 year old woman and l decided to try to learn how to tap dance. I ordered one of your dance floors and am taking lessons on YouTube. Love the little floor! 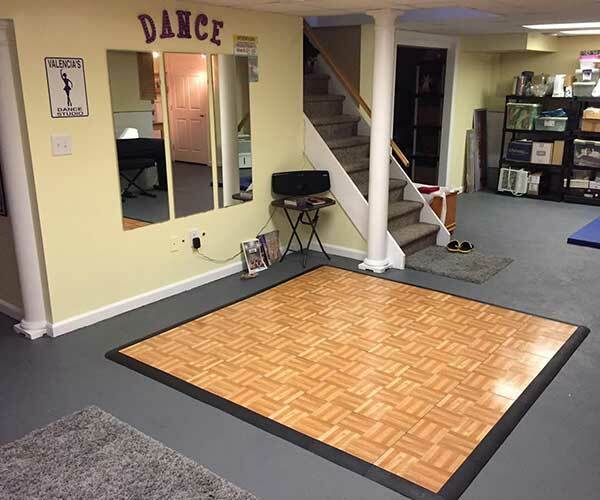 Attached are two photos of the 7x7 dance floor kit that I set up in our basement remodel for my daughter. She loves it! She loves having her own dance space to practice all kinds of dances but especially loves having somewhere to tap at home. The product is great. Very well made and super easy to put together. We could not be happier with it.